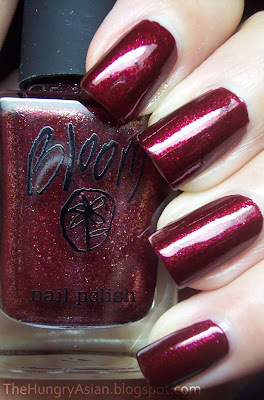 Another beautiful polish I received from Nixxy is Jessica Mauboy I by Bloom. It is such a gorgeous red, in the bottle there is a lot of gold and pinkish micro glitter that doesn't quite show up on the nail. This is 3 coats with a coat of SV. I just love this bottle, I guess I like square bottles! Now that is one hot red! That color is so gorgeous!!! Ah! This is simply stunning! I may just have to buy this bottle of Jessica for myself! 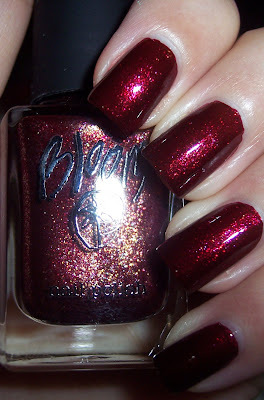 :) Jessica Mauboy is as beautiful as this polish, so she'd have to be pretty happy with it! Wow Kae! This polish is like wearing jewels on your nails. It's beautiful on you. How have you been? I hope well! Oh, gorgeous! I love it. I like square bottles too! Haha! Wow what a gorgeous nail polish! I love that colour! It looks like it would go great on toenails. Ange-Marie - Thank you, they are my fave too! Pinkginger - Thanks! How have you been?! Velvet - Hi! lol that's exactly it! Thank you so much, I've been doing well (besides getting rather sick in Dec). The Swatchaholic - yeah I know what you mean, maybe they will consider selling to us soon! Keepingbeauty - Thanks, yeah I think they would look great on toes! Beautiful shade on you. I can see the pink and gold shimmer. I don't own any of this brand. I'll just enjoy looking at this on you! I can't get enough of rich colors like this one. Do you know where to buy this brand?